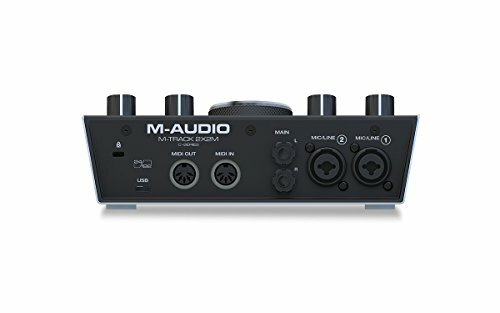 The M-audio M-track 2x2M is an exceptional product, which makes sure that the joy of audio recording is not diminished through the difficulties of technology. A good review can help a person in finding out everything about a related product or service. Taber’s Best Reviews understands this fact. That is why we make sure to provide high-quality reviews only. This time, we are going to give you a thorough M-Audio M-Track 2x2m assessment. It will help you to understand everything about this topic without spending days accumulating the information. We will help to inform you of all the qualities as well as the drawbacks of the M-Audio M-Track 2x2m C-Series. We will highlight all the different aspects of this product, pros, and cons alike. We will tell you our thoughts on this product as well. After reading these features, we understand that you want to know our opinion on this product. Maybe you have already decided because of the many features we have already listed. 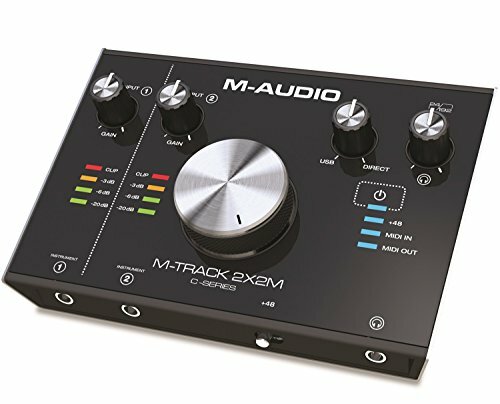 According to us, M-audio M-track 2x2M is an exceptional product, which makes sure that the joy of audio recording is not diminished through the difficulties of technology. 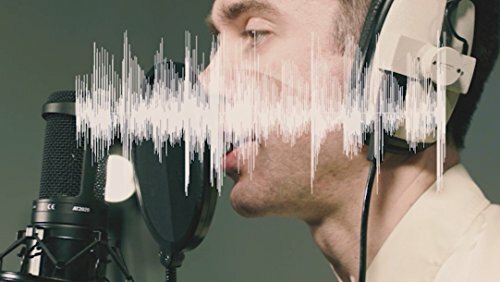 The combination of the latest innovations with the essential functions of an audio recording interface, we believe it to be one of the leading products, of this nature, on the market. The software collection, which comes with it, is enough to assist any professional. You will enjoy the user experience of this product as well as the audio quality. You may face some problems with the USB, as it has different slots. 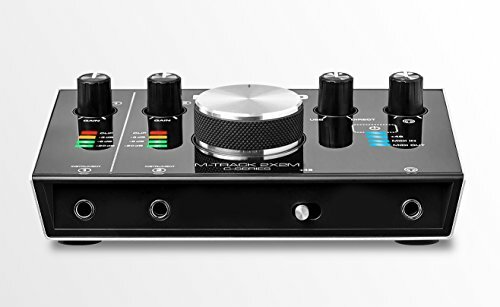 The connection problem is a bit of a downer, but if you do not utilize that portion of the device, then this is the best audio interface so far. While some products come with more disappointments, M-Track is a definite exception. The manufacturers have generously supplied quality features in this product. You get two XLR+ 0.25-inch TRS combo inputs, Stereo 0.25-inch outs, two 0.25-inch instrument inputs, 5-pin MIDI input, and output as well as another 0.25-inch output for headphones. It comes with software as well. We hope that this M-Audio M-Track 2x2m assessment was able to give you and a complete and concise picture of this product. We highly recommend it to those who want a powerful audio recording interface with a compact size. Multiple inputs & outputs: The most outstanding aspect of this product is the number of inputs and outputs available. It has two inputs and two outputs of USB interface that feature MIDI as well. Hi-Speed connections: The connections are very fast paced, which enables trouble-free operation. When a person works with sounds, every second matters and the USB-C connection of this device ensures that you do not waste any seconds. Great software: M-Track 2x2M comes with great software. 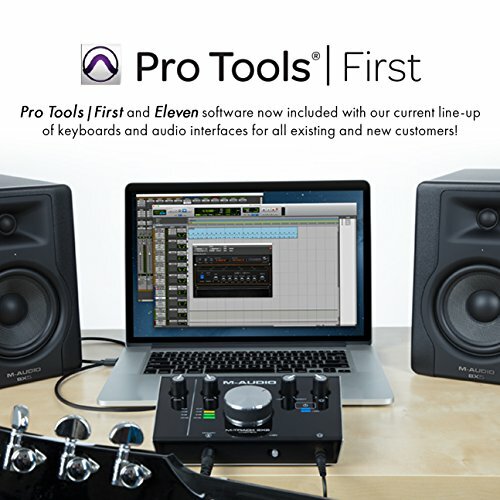 Included are programs such as AIR Creative FX Collection, Strike, Steinberg Cubase LE and Xpand! 2. All of these are ample for starting and completing your audio recordings with ease. Professional recording: The software works smoothly with the user-friendly interface of this device. You will have virtually no trouble with the recording capacity of this device as it is made for professionals. Easy to transport: You can carry it with much ease thanks to its small, lightweight size. The design of this product makes transportation as easy as pie. Effortless installation: You will receive an instruction manual with the device detailing all aspects of set up and use. However, the device itself is superbly easy to install and takes a minute amount of time. Crystal Preamps: The Preamps assures that the musician acquires maximum noise reduction while recording their audio. This is a significant advantage to using this product, which you will not find in other models. Zero Latency Monitoring: Latency means a delay in the technical aspects of signals and the devices related to them. When we are talking about audio recording, it is understood that minute delays will damage the quality of the final product. This product has zero latency monitoring to help you overcome any issues. Compatibility: It is compatible with numerous devices. You can use it with Microsoft Operating System and MacOS. Harmony is one of the huge features of this product. User-oriented: M-Track 2x2M is entirely user-oriented. It caters to the needs of every recording professional by providing a quality interface along with high quality of performance. Power packed: M-Track 2x2M delivers 24-bit/192kHz studio-grade Rest assured this device gets the results you would expect from a super power packed performer. It is meant for Professionals: As you already know, this product has an extraordinary amount of power. Along with that, it also has 48V phantom power for microphones and the MIDI interface. Excellent technical support: The technical assistance of M-Audio is exceptional. It is friendly, fast and makes sure that the customer gets the most effective solutions to their problem. Compact: The size of the device is much smaller than the size of most of its competitors. This compact size is a significant advantage. Too technical: It can be a little too difficult for those who have no experience in audio recording and audio recording interfaces. Takes time: It will take time to familiarize yourself with this product and its operation. Designed to accommodate professional use, this is another drawback, which disappointed us. Does it work with Ubuntu Studio? According to the official staff of M-Audio, it also works with Ubuntu Studio. Yes, it works amazingly well with FL Studio and all similar applications in this category. The manufacturer of this product is M-Audio. Tim Ryan founded this audio products’ manufacturing company in the year 1988. Tim himself became a renowned entrepreneur by being the founder of this company. M-Audio’s original name was Midiman. 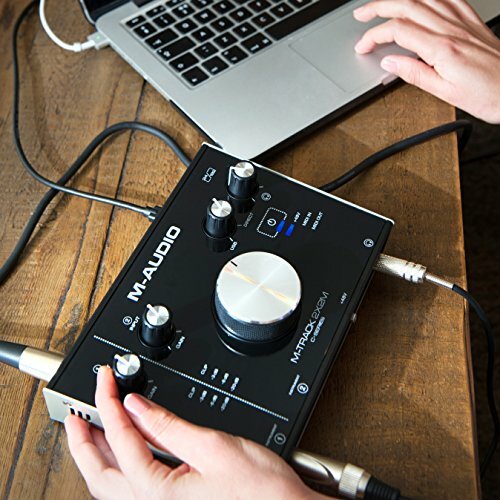 M-Audio produces digital audio-related devices such as loudspeakers, MIDI controllers, keyboards, microphones, MIDI interfaces and digital DJ systems. What Is The Best Price For The M-Track 2x2M Online?